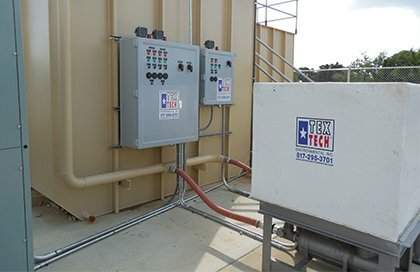 Package Sewage Treatment Plant fabrication | Tex Tech Environmental, Inc. This video is of a 20,000 GPD package sewage treatment plant during the startup process. Having an on-site Package Sewage Treatment Plant fabrication facility allows us to custom fabricate every wastewater treatment plant that we design and build. We make sure every Package Sewage Treatment Plant we fabricate is manufactured with the strictest of standards, ensuring that each wastewater treatment plant is of superb quality. Each of our Package Sewage Treatment Plants are manufactured to TCEQ standards: sewerage systems (domestic wastewater treatment systems) or material alterations to sewerage systems are required to be developed in accordance with state design criteria. The design criteria set minimum standards necessary for domestic wastewater treatment systems to function properly and meet requirements for effluent quality. The criteria also contain certain safety standards.